"I've got your boyfriend on my mind; I think you know she stayed with me last night (...)"
Shura - What's It Gonna Be? My first reaction when I heard the news of the SCOTUS decision was astonishment. It was only a few hours later when my mind really started to comprehend what happened. At least with respect to marriage, we're no longer second-class citizens. I vividly remember the day my wife and I legally married in California, just a few days after SCOTUS struck down Proposition 8. Six months prior, we had a beautiful domestic partnership ceremony where we were surrounded by our family and friends; and, although I was ecstatic, I did not cry then. I cried, however, when I heard our officiant say the words, "by the power vested in me by the State of California (...)." 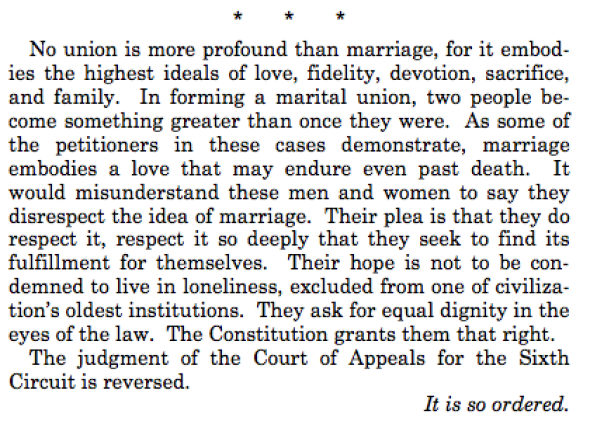 To have our relationship finally recognized by the law, not as a "partnership," not as a "union," but as a "marriage," was too powerful a moment and I could not contain my tears from falling. I'm constantly looking for lesbian-themed movies to watch but I know they can be hard to find. To help with this, I've compiled a list with over 180 titles "-"
I'm probably already late to the party but swooned by her charm, witty lyrics and dead-pan singing style, nonetheless. Out singer/songwriter Courtney Barnett is a breath of fresh air and I've been listening to this song, on a loop, for the past week. RBG A tribute to Justice Ginsburg in the style of Notorious B.I.G. 's "Juicy" Yeah-this song is dedicated to all the judges that told me I'd never amount to nothin' because of my gender, to all the people that lived in their ivory towers that I was hustlin' in front of, that tried to buy me off by putting Susan B. Plot: Jane is a plain old greeting card employee, but everything changes when Zoinx and Zylar visit planet Earth. They are concerned that too much love is destroying the ozone layer and are determined to have their hearts broken to save our world. A seriously unique film! I know it doesn’t look great at first glimpse but this crew have gone above and beyond to bring you a light hearted and hilarious lesbian themed film. The film is in black and white which you forget about in the first minute. The alien’s attempt to assimilate to our human culture is curious and well thought out. The aliens even have their own language which is a creative credit to the writers. A film made by lesbians with no heterosexual side stories. A satirical low budget film with a flawless plot, great laughs and feel good moments. Give it a chance! If you’re into quirky things, you’re welcome.